First he was the Gladiator, then he was Robin Hood, and now he's...Roger Ailes. Russell Crowe was completely unrecognizable as he strolled the streets of Manhattan in full costume to play the disgraced late Fox News CEO. The Academy Award winner sported a full prosthetic fatsuit to complete his look for an upcoming Showtime TV Series on Tuesday. 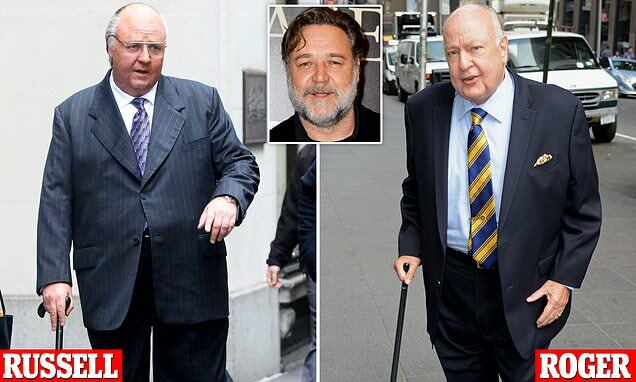 Crowe, 54, was dressed in a pinstriped suit, complete with a purple tie, cane, and Ailes' wire-frame glasses. Production for the still unnamed Showtime series, based on the book The Loudest Voice in the Room, began in New York City this week. The show will also star Naomi Watts as Gretchen Carlson, Sienna Miller as Ailes' wife Beth, and Simon McBurney as Rupert Murdoch. Showtime's new limited series will mainly focus on the last decade of Ailes' life, including his fall from Fox after a slew of women accused him of sexual harassment. It will also include flashbacks to defining events in Ailes' life and will be told through multiple points of view. 'In many ways, the collision between the media and politics has come to define the world we live in today,' Showtime Networks president and CEO David Nevins told Variety. Sherman has written the first episode of the series with Tom McCarthy, who won an Academy Award for his script for Spotlight. The show marks Crowe's first major foray into American television.